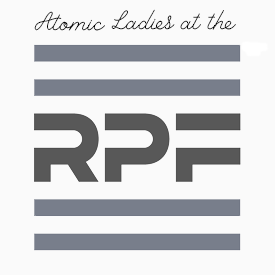 Sean has a background in Animation and Illustration and paints almost all of the props made by the Atomic Ladies. 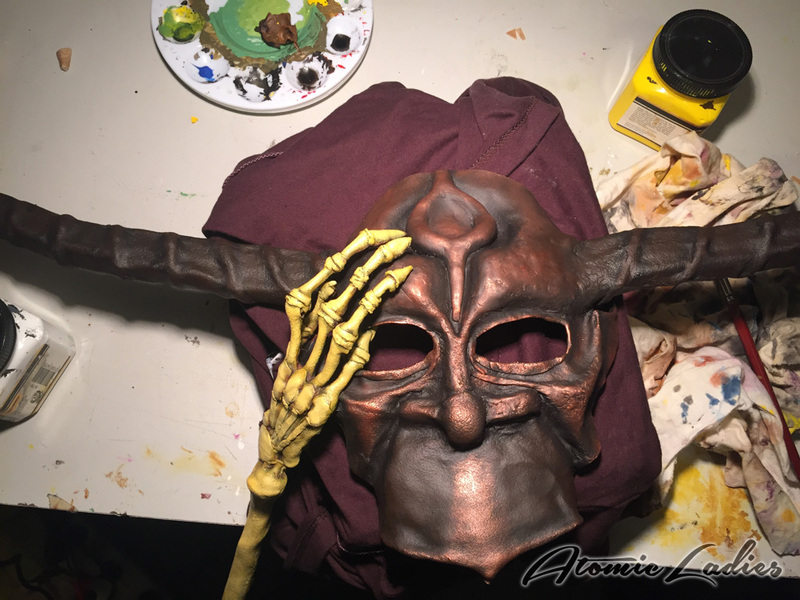 Recently he has started to create the entire Judge Death costume, learning many new skills along the way. That’s it. Three images to work with. 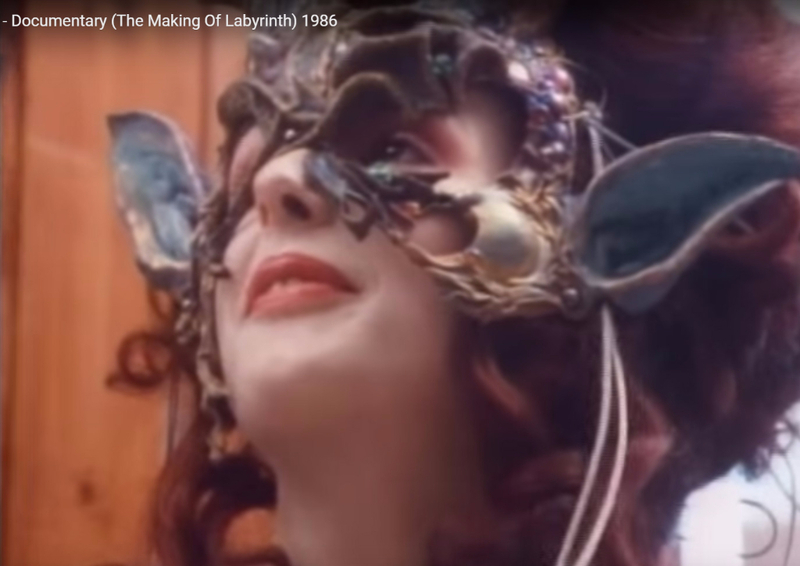 In addition, I looked at a few of Brian Froud illustrations for his take on a Fairy tree/forest look and fill in some of the details on the woman’s mask. We’ve used affiliate links on some of the items you may need, buying from the suggested suppliers is completely optional. If you do use these links, it will help to fund our future projects. Contact Cement (I used Sika Contact-4600AU), use a high strength quick drying cement. 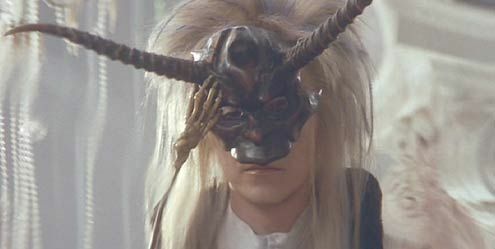 As these are custom Labyrinth costume masks, I first took measurements from my sister’s face and traced it onto Worbla to make the basic mask shape. 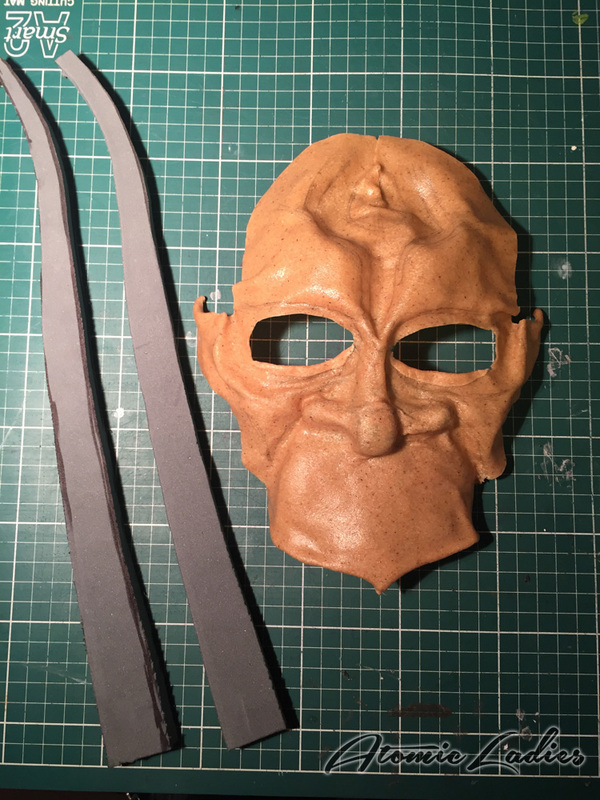 Using the Heat Gun and some basic sculpting tools – including a chopstick, skewer and craft knife – I began shaping the mask. 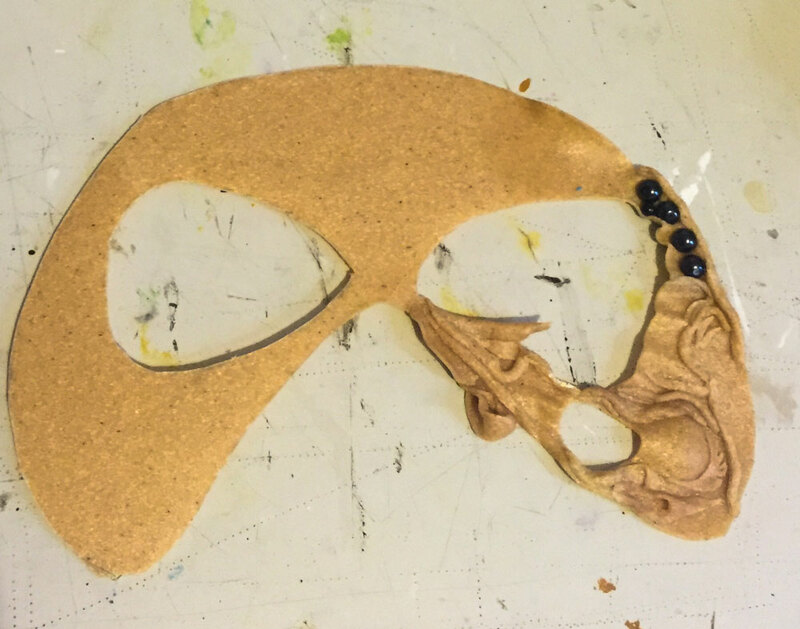 Small organic shapes were cut from scraps of Worbla and added to the mask to build the details. Beads were also incorporated into the shape. 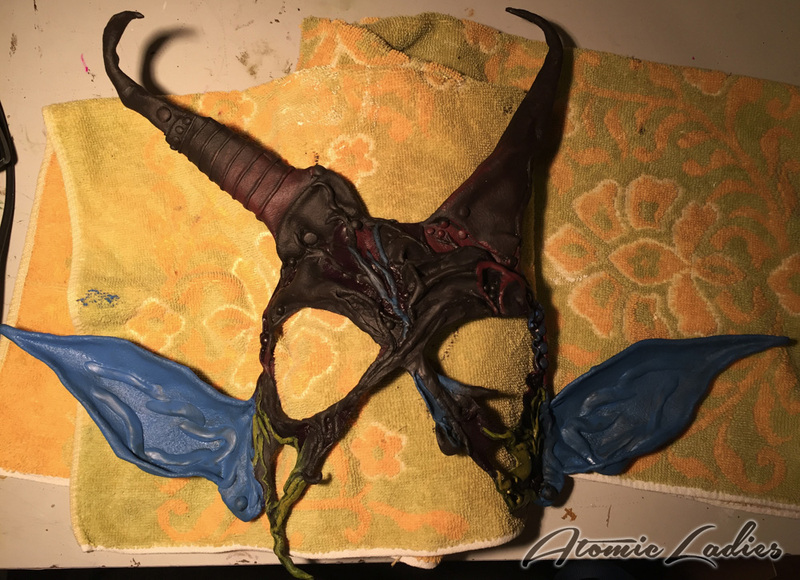 After cutting a hole in the right side of the mask, I shaped it form the face shape and continued adding vine and branch details. The addition of the horns was up next. First I measured and cut flat shapes out of Worbla, they were then heated and the basic shape made from the points down. 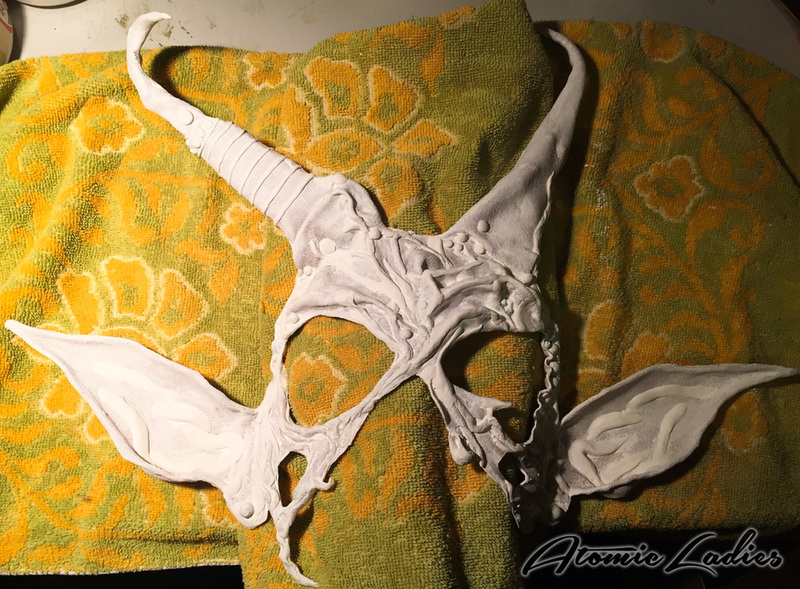 I left the base of the horns unfolded until I fused them to the basic mask shape. 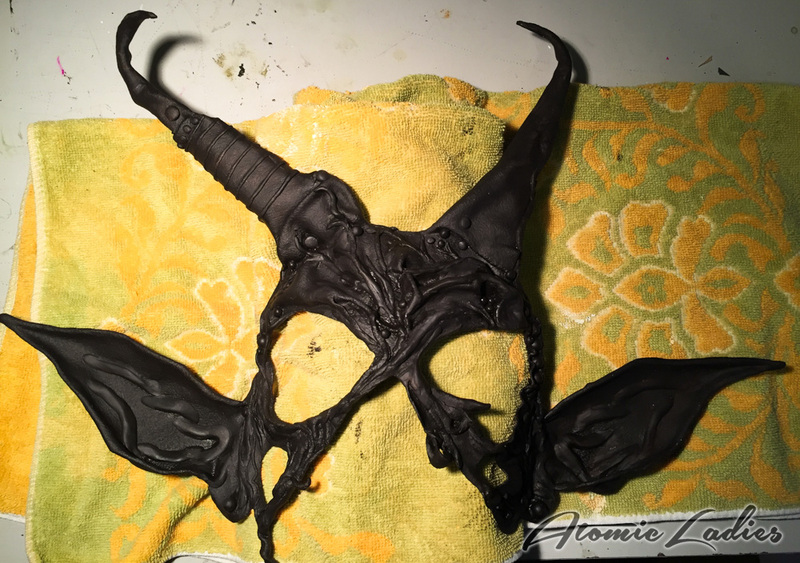 Using the heat gun I formed the horns onto the base and folded them into shape. 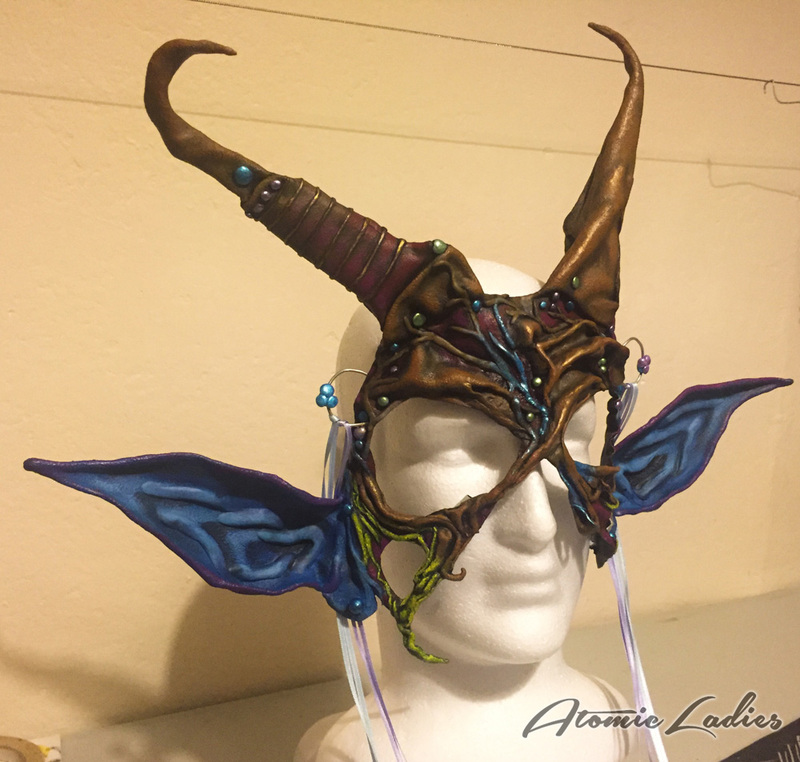 With this technique I was able to unify the shapes and create the look of the horns growing out of the base. Some vines were then added to the base, moving up to the horns. 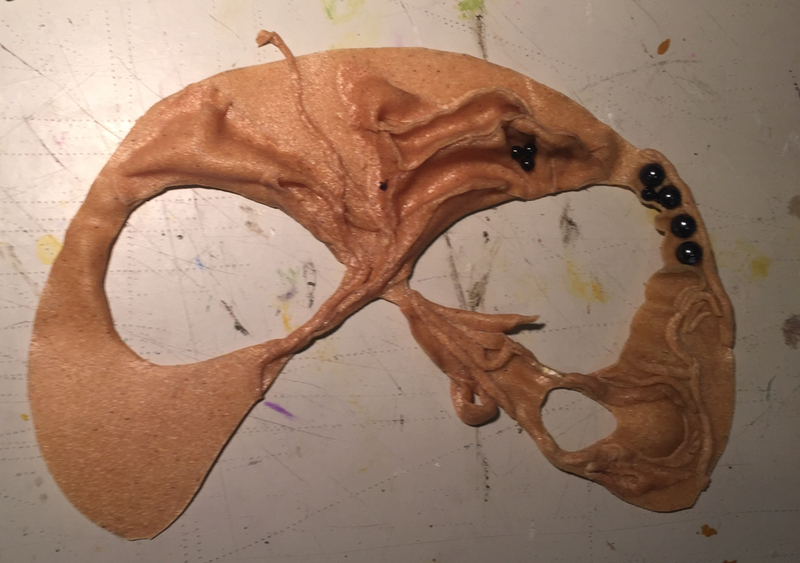 I measured and cut the ear shapes out of Worbla, incorporating a tab so I could fuse it to the mask base. I made the shapes 20% larger than I needed. This gave me more room to create an inner curve and add a fold around the edges, which gave fullness to the ear. 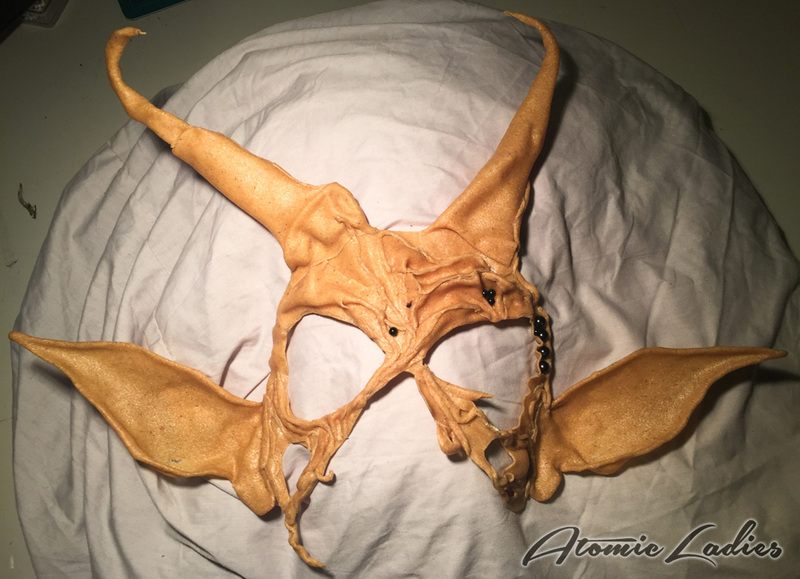 Once the ears were fully shaped I fused the tabs to the front of the mask. I added the final details with Epoxy-Clay, these included; ear details, smaller vine details, additional gem spheres and cleaning up the seams between the Worbla panels. 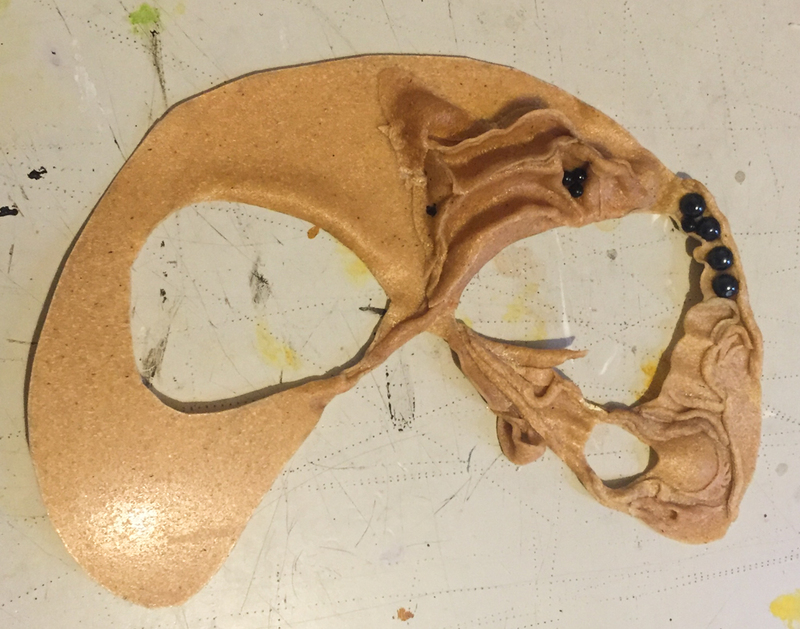 Once the Epoxy-Clay was dry, the whole mask was painted with Gesso, this gave the mask an even tooth for painting. To begin painting, I paint from dark to light as I find this the most effective way of simulating realistic contours and shading. It works for both flat painting and really accenting the depths and highlights on a 3D piece of work. 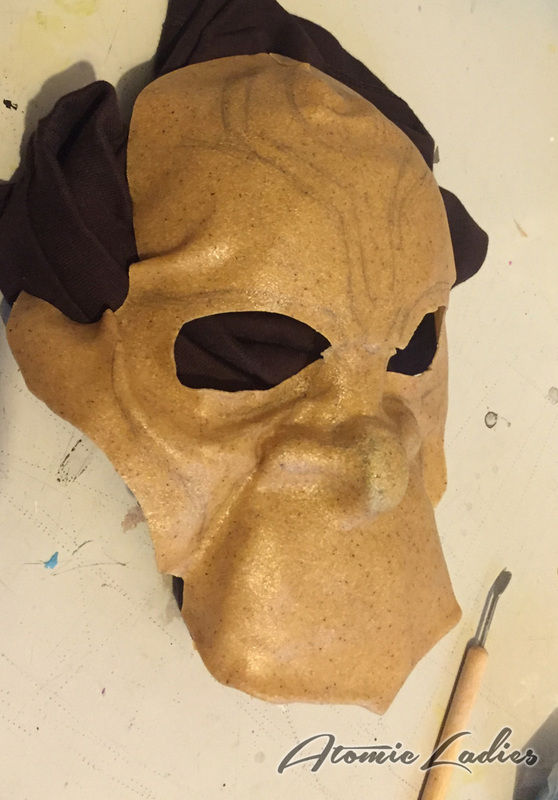 To begin, I put down a dark brown base coat over the whole mask. The next step is the base mid-tone colours, this is where all the major areas are blocked out from each other. 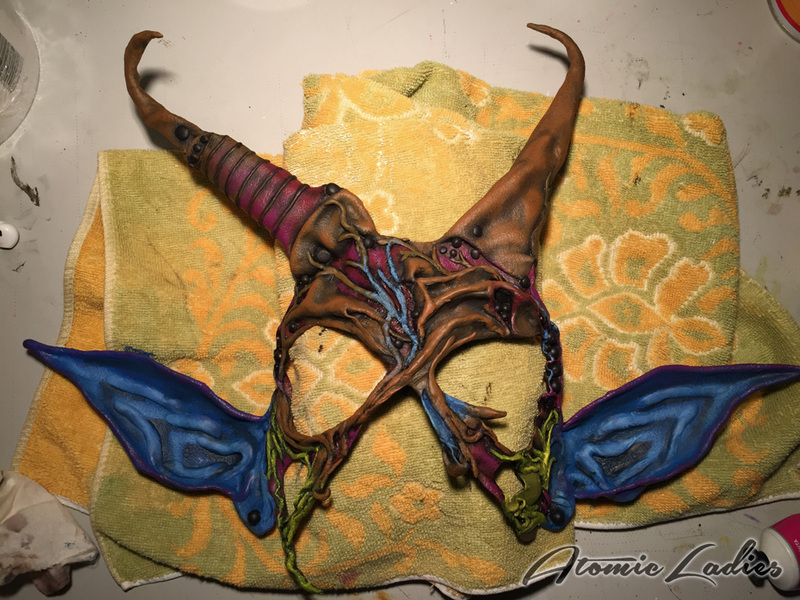 As you can see, the majority of the mask is brown with shades of purple, blue for the ears and some vines, and some yellow gold details. To finish, a highlight layer is added to brings out the depth of the shapes. For these areas I usually use pure unmixed colours, sometimes though with a touch of white. Go easy with the application of paint, at this stage less is more: small highlight areas make a contour look sharper or much deeper, you can also use the ‘dry brush’ technique (wiping most of the paint onto a rag before painting the object) this will give the paint layer a textured look. At this stage I repainted the gems with the darkest tone to prepare for the next step: adding the shine. To achieve the magical shine finish I painted the gems using Liquitex iridescent inks and an acrylic medium base. 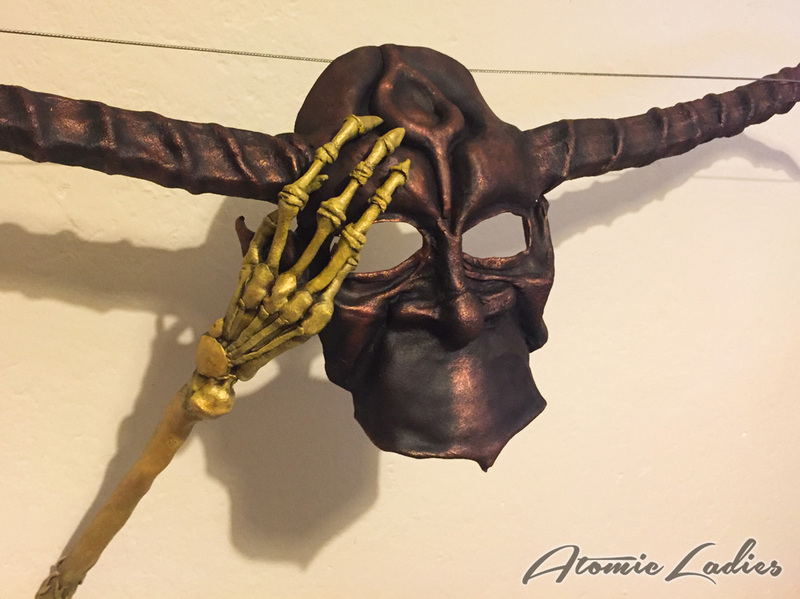 Golden touches were made using Rub ‘n Buff Gold Leaf heavily in areas of gold and then very lightly across most of the mask to give a glittering finish. Finally a Gloss Varnish was painted over the whole mask. The rings are made using Armature Wire and Epoxy-Clay. The details are painted with iridescent ink and finished with thin blue and purple ribbon. 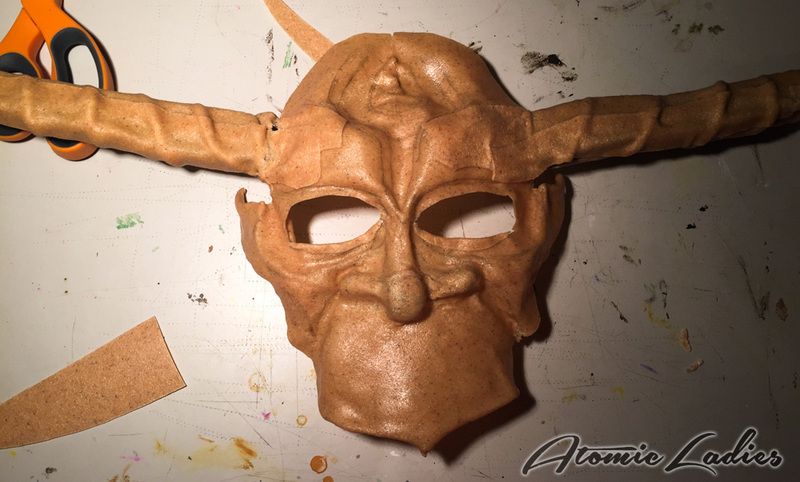 These were bonded to the mask using a combination of Contact Cement and Worbla. 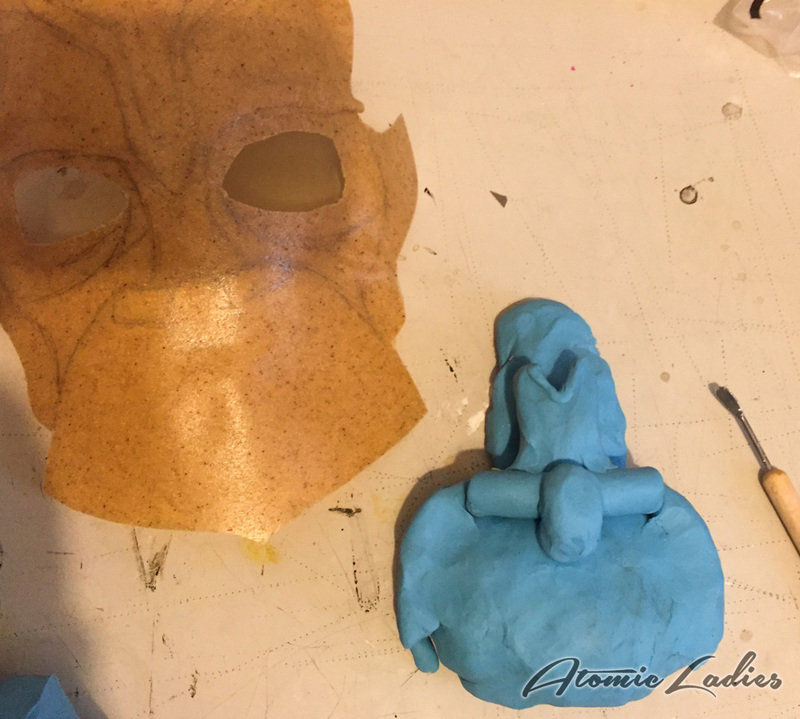 After measuring the face, I drew out the basic mask shape and cut out the Worbla, using a heat gun I began curving the main contour of the mask. 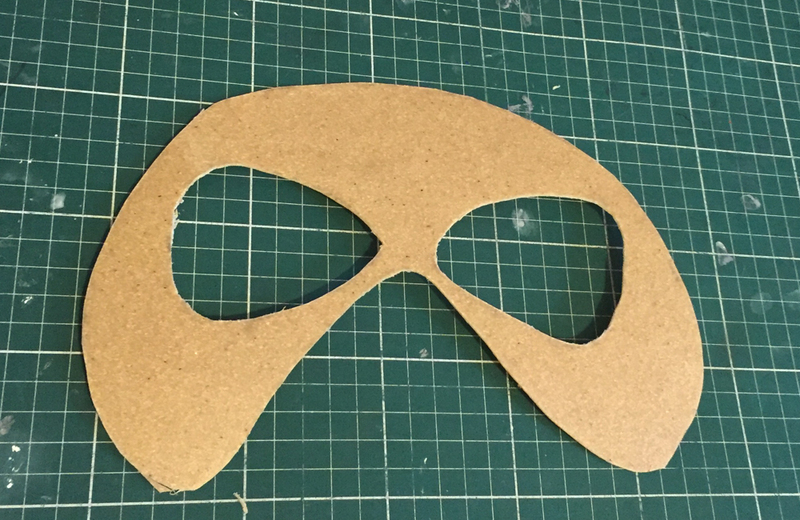 At this stage I had to cut a V into the top of the mask to achieve the forehead curve without getting major folds in the shape. I shaped out a basic nose and mouth with modeling clay, heated the Worbla again and laid it over the top of the clay. 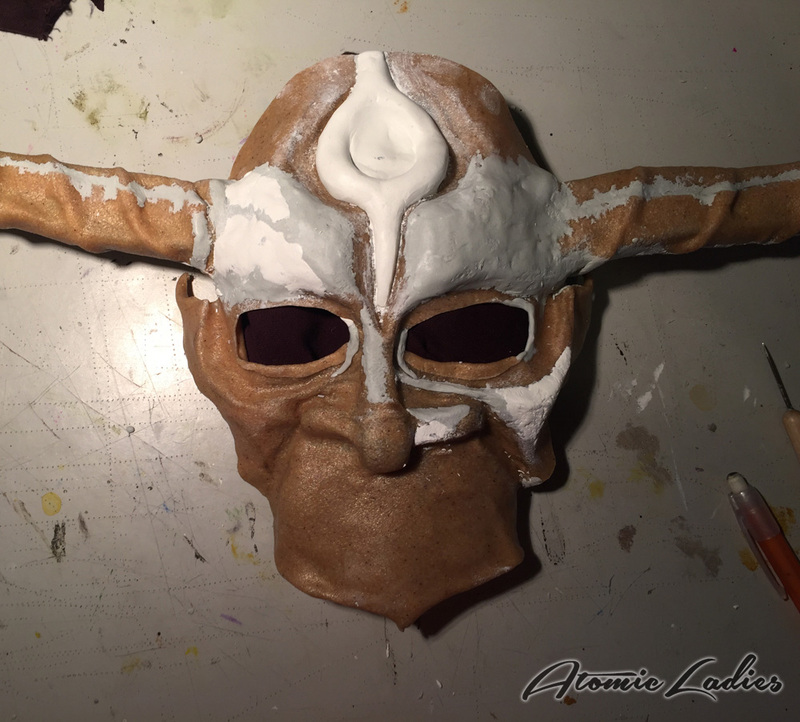 I used sculpting tools to carefully sculpt the nose and mouth shapes into the Worbla, continuing with the heat gun I used a chopstick and a sewer to work the shapes into the forehead. For the horns I measured then cut out EVA foam with a craft knife. I wrapped the shapes in thick armature wire to add texturing to the horns. 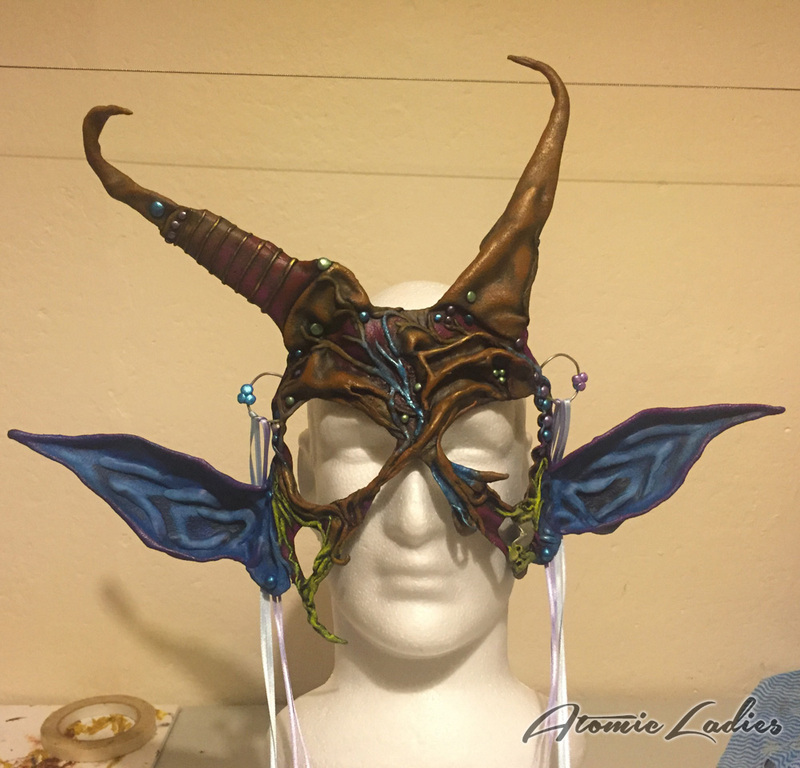 There was extra wire at the base of the horns that was fused to the back of the facemask to give the structure stability (photos of the back structure work can be seen in the hand and arm photo set). 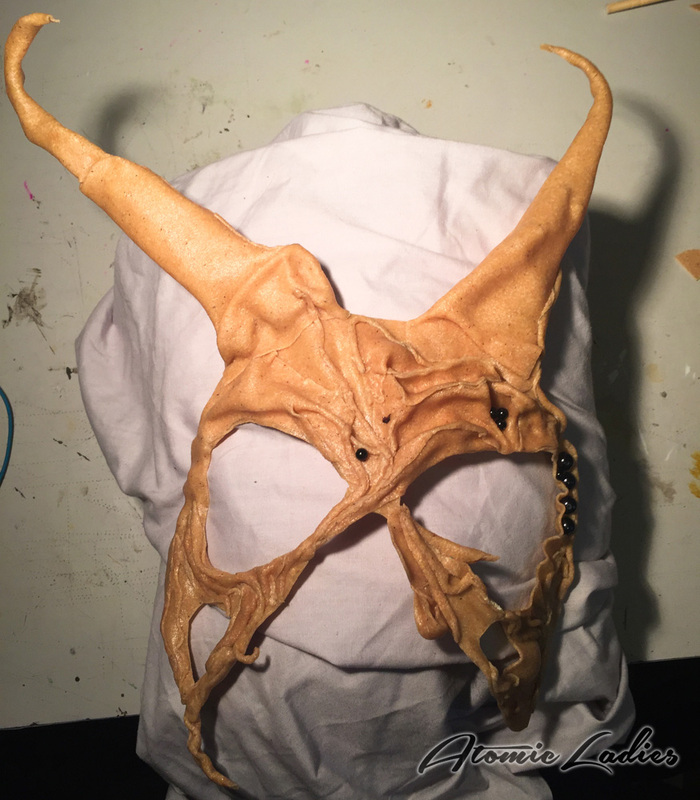 The wrapped foam was then covered in strips of worbla, leaving extra at the base of the horns to fuse to the front of the face mask. 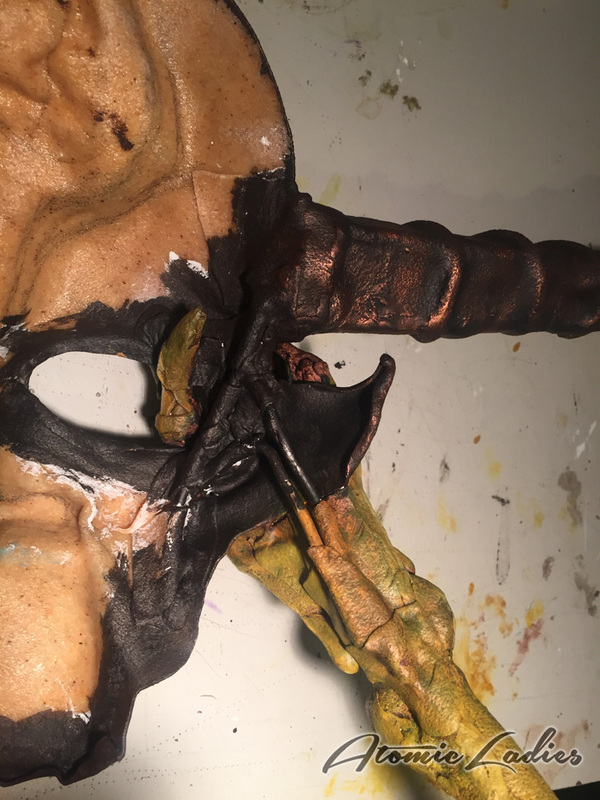 Once the horns had been fused to the face mask I used two part epoxy sculpt to fill in holes, define features, and build the forehead decoration. 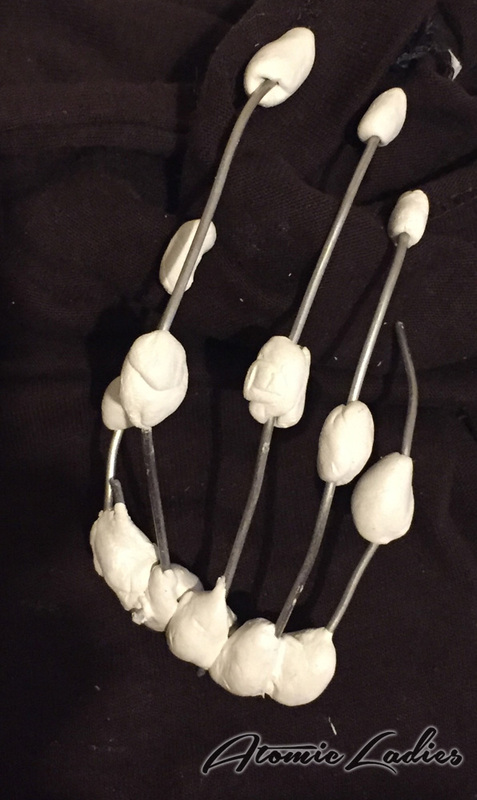 I began building the skeletal hand and arm by making the fingers from medium armature wire. The wire for the thumb also runs under the knuckles where the other fingers join to form the shape of the hand. Once I was happy with the shape I used epoxy sculpt to create the knuckles, joints and ends of the fingers. Thick armature wire was then wrapped around the knuckle area and used to wrap around the dowel stick that forms the base of the arm. 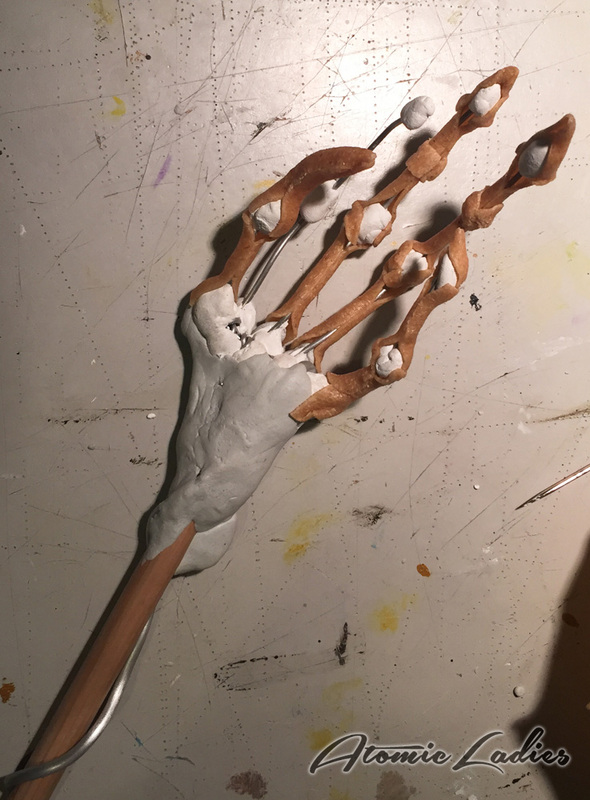 Epoxy sculpt was then used to form the shape of the hand and wrist. 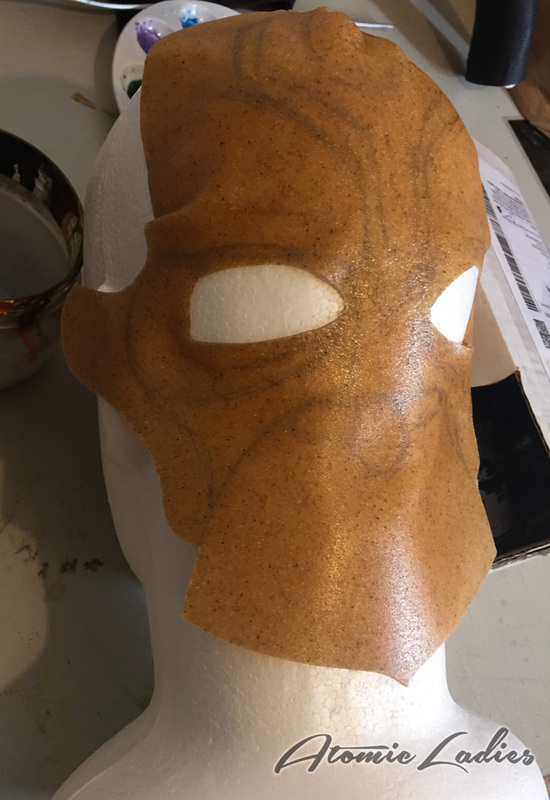 With the base shape in place I began to heat and wrap with Worbla. For the fingers I used small rectangles and triangles to form the bones. 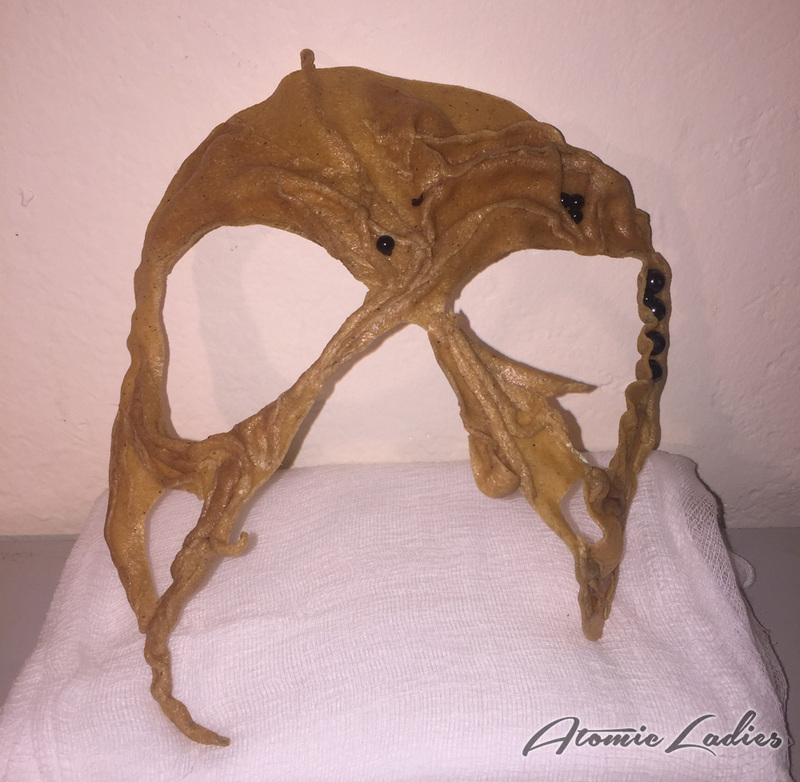 The ends of the fingers remained open underneath, as this side will be fused to the mask. 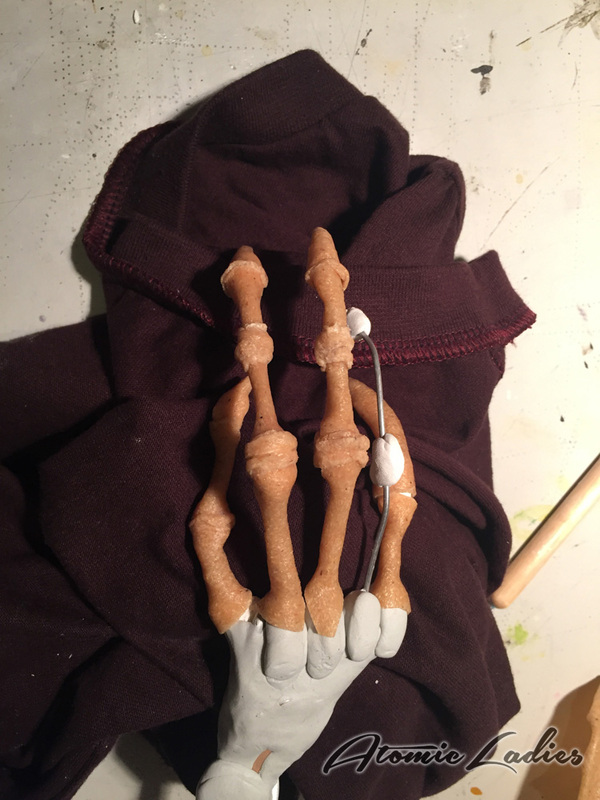 The finger bone Worbla was fused to the knuckles and then carefully wrapped around, but not touching, the wire, in order to give the bones more shape. 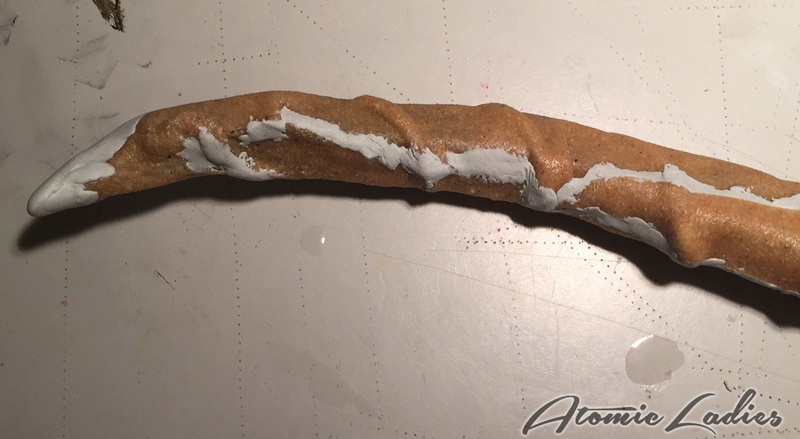 After creating the shape of the fingers, I then wrapped the hand, making an extra ball of Worbla for the wrist and then wrapping the rest of the arm. Finally I cut shapes to define the hand, knuckle and wrist bones, then filled in any open spaces with epoxy sculpt. 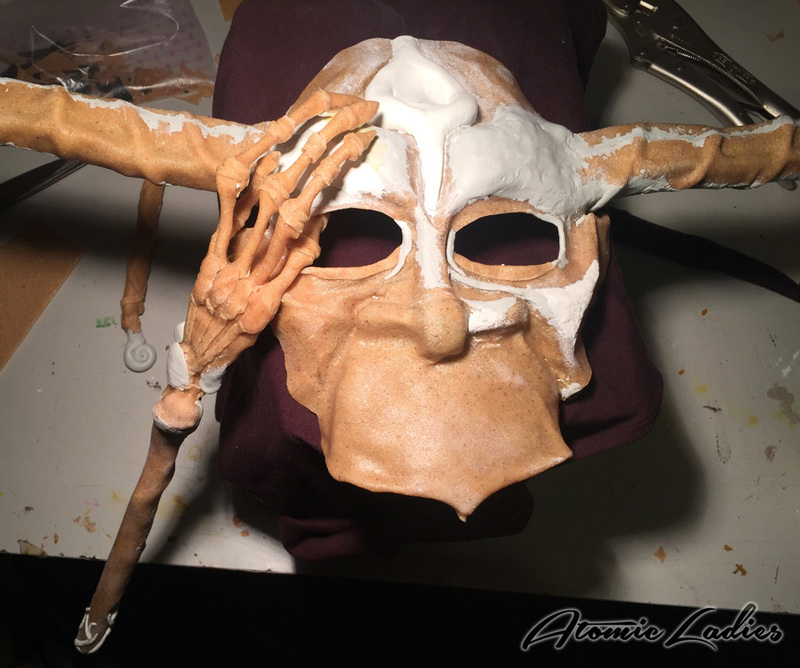 The finished hand was then fused to the face using a combination of Contact cement in front and armature wire and Worbla behind for structure and stability. As you can see in the last photo of this set, the wire from the horn runs down to the cheek, and two strands of wire extend from the hand going behind the cheek bone area then dividing and connecting behind the Horn wire. 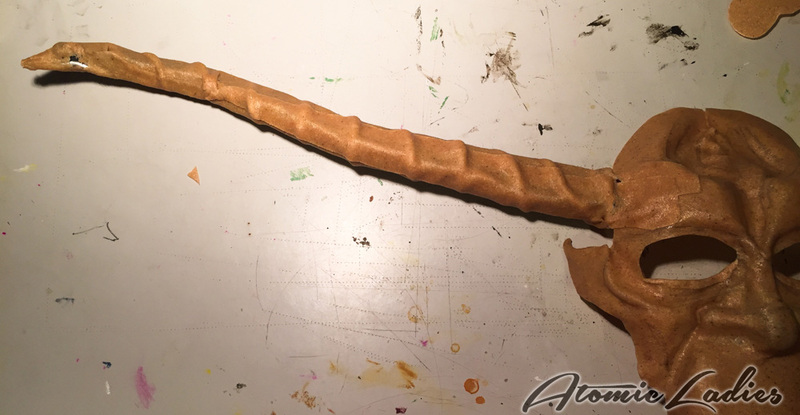 This structure is then fused together with Worbla and creates stability for the horn and the hand. After the structural complexity is over it’s onto the simple painting! 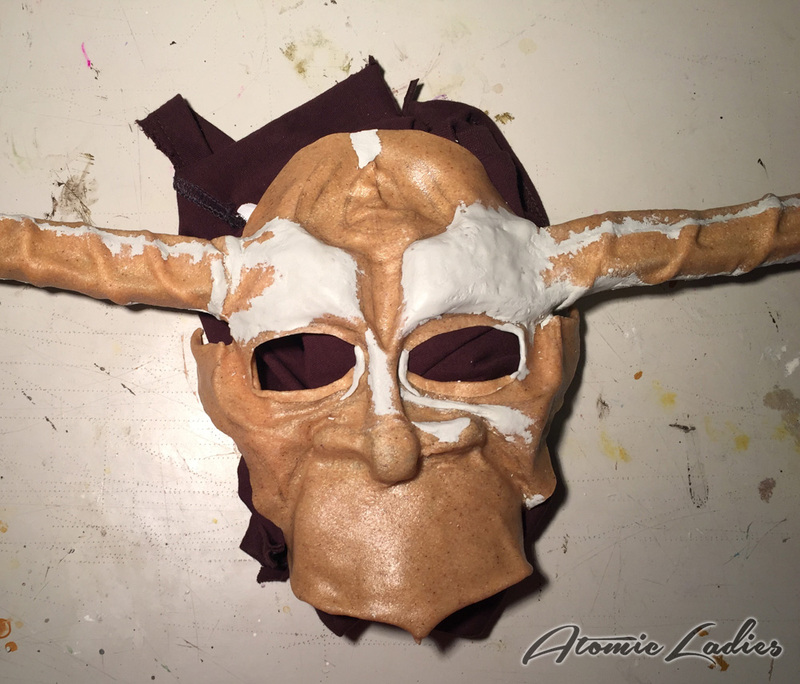 First a coat of Gesso to give a consistent tooth for the paint, then the undercoat: Dark brown for the mask and a lighter brown for the hand. Copper acrylic paint was then lightly applied to the highlight areas. For this look only one careful layering was needed. The hand was done in a light yellow, covering most of the structure, and finished with a light touch of metallic gold buff for highlights. Finally the whole thing was finished in a gloss coat of Varnish. 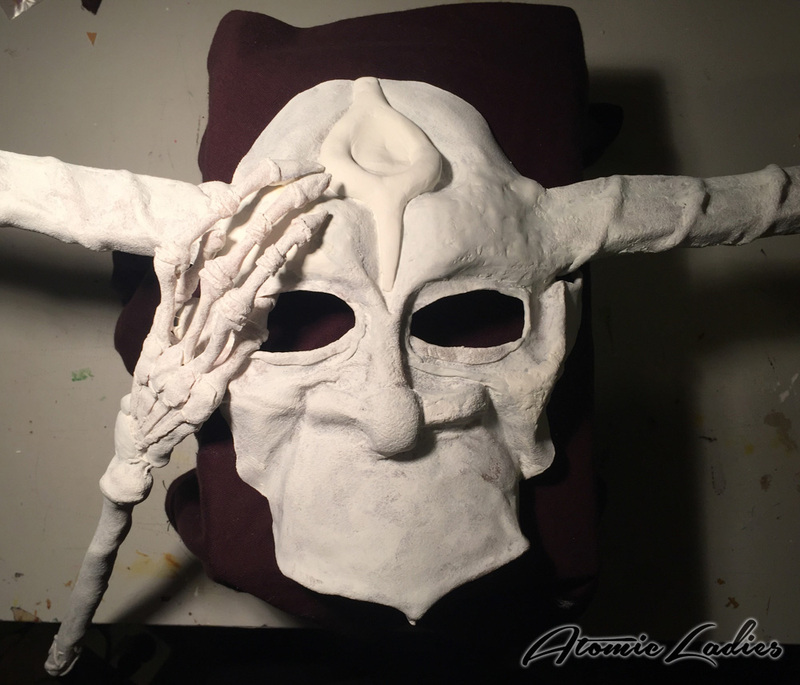 Side note: both masks had elastic applied to the backs using contact cement and Worbla to connect to the masks. 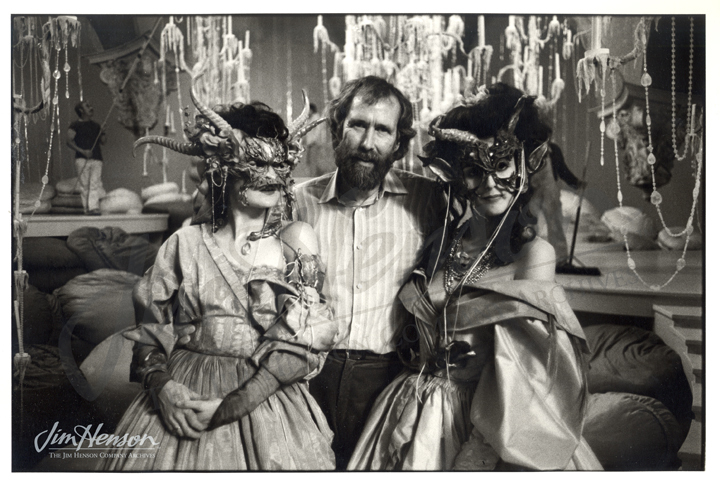 Fabric scraps were also cemented to the backs of the masks’ foreheads to make them comfortable to wear. Presenting Mr and Mrs. Winbolt in their masks before stepping off to the ball!